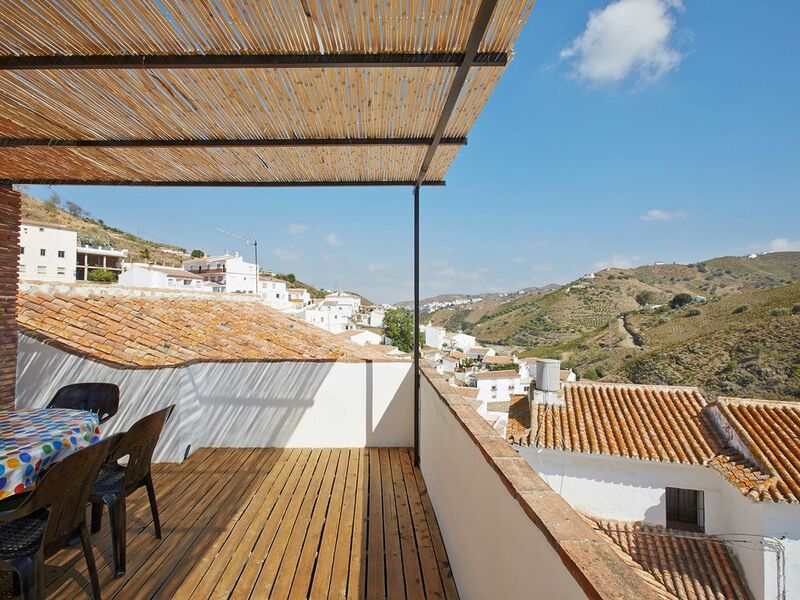 Casa Dimitri is an authentic townhouse in the center of an andalusian white village. The house comprises 3 large sized bedrooms: 2 of them have a double bed, the other bedroom has 2 single beds. All bedrooms are situated on the first floor around a lobby / playground with underfloor heating. The bathroom on the first floor also has underfloor heating. On the ground floor you'll find an 8 seat dining table, a big living area, a desk for your correspondence and a big kitchen with Smeg cooker. The ground floor gives entrance to a small patio for cool-seekers and further up leads the staircase up to the 60 sq.m. terrace for the sun seekers. The terrace is partially covered (see pictures) but has stunning views of the surrounding town and mountains. In winter time the house is heated by a woodburning stove and the underfloor heating. Bathroom 1 with bath/shower, wc, lavabo. Open living room with 2 sofas, TV, radio/CD, dining room with table for 8 persons. Kitchen includes Smeg cooker, fridge, microwave and blender. Alles was goed geregeld. Hebben een heerlijke vakantie gehad in een fijn huis. Fijn dat jullie een leuke vakantie hebben gehad. Nous avons passé 15 nuits dans la "casa Dimitri" avec nos deux enfants de 15 et 13 ans et nous avons été enthousiasmés par celle-ci. La maison est conforme à toutes les photos qui sont présentées sur le site abritel : typique, charmante, spacieuse, bien équipée, très propre. A ce propos merci à Alicia qui nous a accueilli et qui s'occupe de la maison. Merci aussi à Dimitri qui a répondu à toutes nos questions avant notre départ. La maison se situe au coeur du petit village typique de El Borge à flanc de montagne. Nous avons adoré ses commerces et ses habitants sont très chaleureux. La piscine municipale qui se situe à quelques minutes à pieds de la maison est également très agréable. Merci bien pour votre recommandations! The beach of Torre del Mar and Rincon de la Victoria is at 20 minutes. Kid stuff: small swimming pool for on the roof terrace, gates for the staircase, relax for a baby, cot for a baby, little park for a baby.